Every adult hopes that in the near future he would have a family of his own. This dream remains unfulfilled for many couples and the doctor couple of Anil and Geeta Khanna have made it their lifetime mission to fulfill this dream for childless couples. Ajanta Hospital Lucknow under their patronage and lifelong dedication has accepted this challenge to give hope to couples who has medical problems that prevent them being happy parents. The IVF Centre of the hospital uses updated modern technology to solve reproductive problems of couples and use accurate methods to help them realize their dreams. Ajanta Hospital also offers to its patients specialized health care programs that help them to recover from their problems at the earliest. Help childless couple to enjoy a family with the help of their IVF Center and its updated reproductive methods. Create better healthcare facility for the general patients. Provide patients with specialized health problems like nephritis and heart ailments swift health solutions. Encourage medical tourism in India where patients from US and other countries, visit this hospital to enjoy their affordable medical care. Medical treatments have become very expensive all over the world. India is a popular destination for medical tourism. By the term medical tourism we would mean that patients from around the world come to Ajanta Hospital and get treated using the state of the art hospital infrastructure backed with great quality healthcare service. This helps the global patients to receive treatments for their ailments which would have otherwise remained untreated in their country. India is new to this concept but is fast catching up with other countries like South Africa, Jordan and Israel. Patients at Ajanta hospital can thus enjoy a hassle free medical solution to their problem and get back to good health in no time. 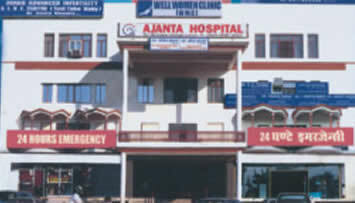 The official address for Ajanta Hospital is Ajanta Hospital & IVF Centre, Near Krishna Cinema, Kanpur Road, Alambagh, and Lucknow (U.P.). If you want to fix an appointment or have any queries regarding the hospital you can call these numbers which are 0522- 2462335, 2465107, and 4032888 with Ext: 224, 221, and 223. From the city’s railway station you can reach Ajanta hospital within six minutes and is only 3.5 km away from the railway station. Most taxis and auto rickshaws would take you there. One of the key landmarks is the HP Petrol Pump near the hospital. What is the tentative salary for experienced MBBS EMO? sir i want to you have any vacancy of dialysis technician?